Ian Kerr reports from this year’s Talmag Trial at Hungry Hill, Aldershot, where riders pit their classic four-stroke solo and sidecar machines against the old-fashioned kind of sections we once knew and loved. 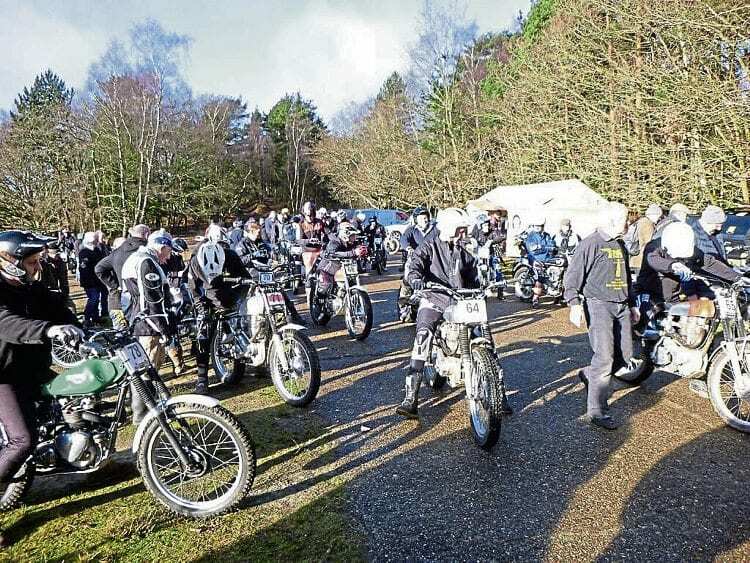 The word appears to have got out about the Talmag being one of the premier four-stroke classic bike trials in the UK and worth a look at the end of January. The long shadows of a bright crisp January morning begin to shorten as a batch of riders in this year’s Talmag Trial prepares for the ‘off’. By the 9.30am start time, the normal car parking area at Hungry Hill, Aldershot, was full and people were heading literally into the bushes to find a parking space, and continued to do so for some time afterwards as 200 competitors, split into six classes, headed off to tackle lap one of two comprising 15 sections (and a special test) spread across the old MoD training ground. Despite some pretty horrendous weather the week before, the sun was shining and the temperature was mild for the time of year, and as usual the sandy soil had drained quite well. Although as the day wore on some sections were still wet enough to take a few marks, the winners in most classes still managed clean sheets. and past difficulties with the MoD over the use of the land. The good news is that such use has been secured for the next five years, so the Talmag will remain at its traditional home of Hungry Hill for the foreseeable future. As the bikes were disgorged from vans or off-loaded from trailers, it became clear that, while they remain four-strokes and, concerning their engines, still retain a visual link to the past, fewer remain in the same condition as during the early years of the event.